Subiendo como una moto: July 14th, 1995: Superhuman speed on Mende! It was on the Bastille Day when the peloton met a new beast, just above the town of Mende. The never ridden before, Cote de la Croix Neuve would receive legendary status from day one. The Spanish team ONCE set Jalabert in the day's breakaway together with Mauri. It was him who did an amazing pace for Jaja all day long and still managed to launch him at a very high speed on the final climb. From there, it was an easy job for Jalabert. Only one year ago a sprinter on the flat, he became now a frightening sprinter...uphill. En danseuse for most of the climb, he won the stage and entered forever in French cycling's hall of fame. After a 200 km breakaway, he set an insanely fast time for the climb: 9:48, 19 km/h average! The peloton started the climb around 7 minutes behind the breakaway. 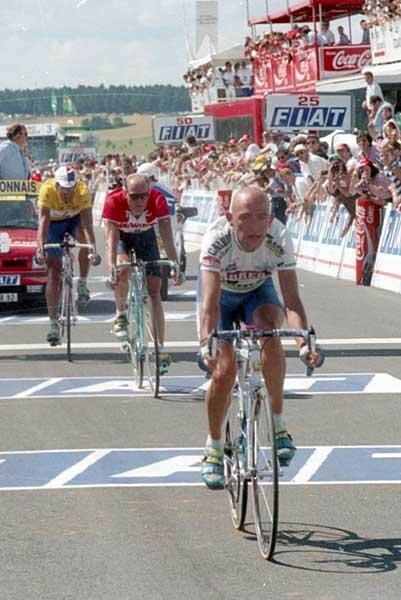 Right from the bottom, Pantani attacked with an amazing strength. On the 10% slopes, the speed reaches mind-boggling speeds. Zulle tries to follow but his engine blows. The yellow jersey, Indurain wants to prove though that he's the best on every terrain, he wants to show Marco who's the best climber. With Bjarne Riis in his wheel, Big Mig accelerates and makes Croix Neuve look like a speed bump. After a super effort, he catches Marco right at the top. The performance of the three is downright cataclysmic. Without a doubt, one the best 9 minute efforts ever seen in cycling. Will we ever see the record of Croix Neuve-Mende falling down?